In reviewing JB Hifi's results and discussing the 'elephant in the room', it is worth reflecting on how the company has evolved over the years since listing in 2003. Back then as a young retailer, JBH was disrupting the incumbents with a new high energy retail format, low prices and compelling range. JBH rolled out stores at a rapid rate and was enjoying strong like for like sales growth as the JBH offering resonated with customers. Fast forward to present, the JB Hi-Fi store network expansion is more or less done, the business has successfully managed a transition from software (music, movies & games) to hardware and has made a large whitegoods acquisition. The key feature of the JBH 15 year history is one of successful execution. JBH managed the structural headwind to its lucrative software category which we estimate was near half its business in the early 2000s, to 10% today, whilst maintaining stable operating margin and managing an aggressive store rollout program. 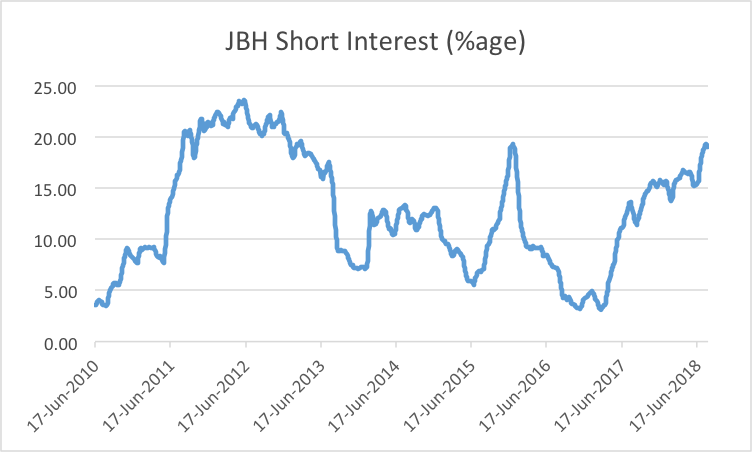 It is with the benefit of this historical context of successful execution that we maintain our positive view on JBH to manage the current set of challenges that are of concern to the market (see rising short interest chart below) namely – Amazon, The Good Guys and the Australian consumer. Let’s just focus on the elephant in the room for the purpose of this wire: Amazon. Businesses that have successfully faced the competitive threat of Amazon in other geographies like Best Buy in the US shows that business models that adapt can survive and thrive (Best Buy trades at a 20% P/E premium today relative to its own history). There is every reason to believe that JBH can manage the threat from Amazon in a similar way because they have a demonstrated track record of adapting to structural pressures in the past and responding successfully. This ability stems from its unique culture of recognising the threats in the first place and then adapting the business in response whilst maintaining an unrelenting focus on its low cost operating model. Over the next 12 months, we expect JBH to deliver mid-single digit EPS growth organically and a 5.5% dividend yield. 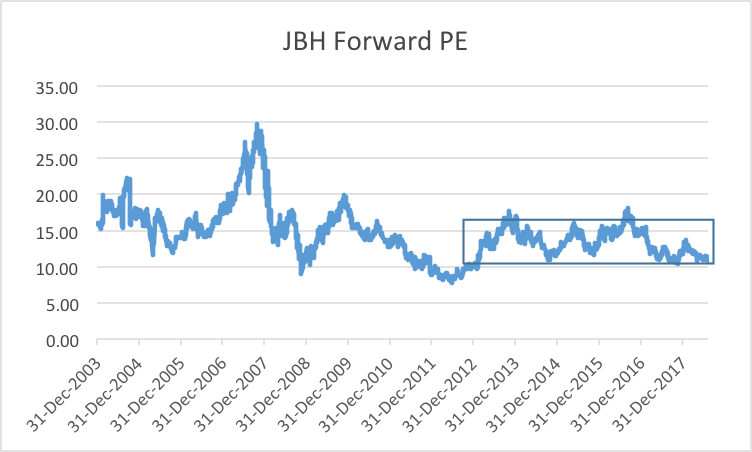 For this return profile and maturity of the JBH businesses, 10-12x 12 month forward PE seems appropriate. However, until the market sees evidence of JBH dealing with Amazon successfully, the stock is unlikely to sustainably push towards the top end of its longer-term PE valuation range of 10-15x that the stock has traded since 2012 (see chart below). It is ironic that Amazon’s anticlimactic launch in Australia in December 2017 delays JBH’s ability to convince the market on this front. So while we believe that the JBH business is more resilient than perhaps the market gives it credit for, we expect that JBH share price remain range bound for a while and hence do not have a position in the stock today. JB Hi-Fi Limited (JBH) fiscal year 2018 net profit after of $233m was slightly ahead of the downwardly revised guidance for $230m (from $235m-240m). Like for like (LFL) sales growth for the core JB Hi-Fi branded stores was strong at 6.2% for the year cycling a steep 11.9% from the previous year and the business delivered stable operating margins demonstrating the strength of the franchise. Trading at The Good Guys that was acquired by JBH in November 2016 has however been subdued with LFL growth of <1% and weaker EBIT margins. The company typically provides sales guidance for the current fiscal year with the annual results which for FY19 are in line with consensus expectations at $7.1bn. However the trading update for July 2018 for JB Hi-Fi stores was weak at +0.3% whilst The Good Guys stores have started FY19 somewhat better but cycling easy comparable store sales numbers. JBH has created a new group function to drive merchandising and supply chain initiatives under the leadership of a senior executive. This organisational enhancement along with previously flagged co-location of support offices of JB Hi-Fi and The Good Guys is a signal that FY19 will be the year of integration and synergy extraction for the group. Overall the result will be well received by investors for having come in slightly ahead of the guidance, but the focus will rightly be on FY19 outlook and the July trading update. With expectations for softer retail trading conditions in the near term because of macroeconomic conditions (low wage growth, subdued housing etc. ), the management’s focus on greater integration of The Good Guys and merchandising/supply chain initiatives is timely. With many listed retailers like Myer, Specialty, Reject Shop and Oroton having struggled or disappeared, JB Hi Fi stands out like a ‘beacon’. We should all hope it weathers the Amazon storm and its Good Guys business lives up to its promise. JB, let’s see if you can do it again !